Christoph Wilhelm Hufeland studied medicin in Jena and Göttingen and became a physician in 1783 at his father's practice in Weimar. In Weimar he stood in close contact with Goethe, Schiller, Herder and Wieland, who all consulted him. In 1792 he became a professor in Weimar. In 1796 he published the internationally succesful "Makrobiotik, Oder Die Kunst Das Menschliche Leben Zu Verlängern". In 1798 he became physician to king Friedrich Wilhelm III of Prussia and he became a member of the Academy of Arts. In 1801 he discontinued his practice in Weimar. In 1806 Hufeland accompanied queen Louise who fled to Königsberg for the Napoleontic troops without bringing his own wife (Juliane Ameling, 1771-1845) and seven children in safety first. His wife left him and married Ernst Christian Heinrich Bischoff, a former student of Hufeland. In 1809 he became professor of Pathology and Therapy at the new university in Berlin. He wrote about almost all subjects related to medicin. 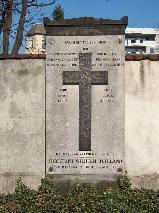 The grave of C.W. Hufeland at the Dorotheenstädtischen Friedhof, Berlin.